1. Warm milk to 110-115� F. Add yeast and sugar. Stir and let sit until frothy (about 5-10 minutes). 3. To make oyster beignets, heat saut� pan over high heat. Add oil. Then, dip each oyster in the batter so that it is coated and place in hot saut� pan. (There should be a small amount of batter that will surround each oyster in the saut� pan like a very small pancake.) One they are browned on one side, turn and lightly brown the other side. Remove from pan as soon as they are browned so as not to overcook the oyster. 4. To make the pancakes, saut� 2-3 inch diameter pancakes in the hot saut� pan with oil. Brown on both sides and remove from the pan. 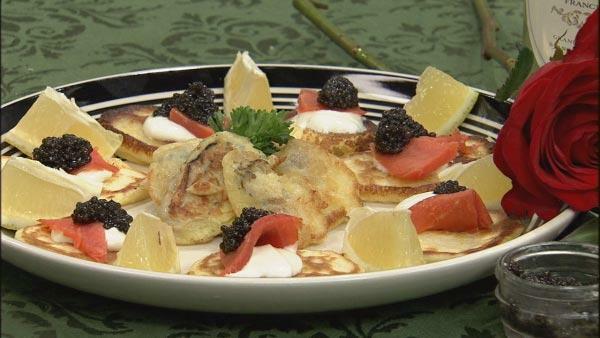 Top each pancake with cr�me fra�che or sour cream and then a small amount of caviar or smoked salmon. 5. Serve the oysters and pancakes immediately with lemon wedges.